In today’s digital age where sales information, analytics, and market research abound oftentimes you find owners giving less value to Investment Sales Brokers and electing to instead vertically integrate their acquisition, disposition and asset management programs. Selling an investment property is a big decision for an owner; the decision impacts investors, future capital, and investor confidence on an owner’s ability to execute on an investment strategy. When disposing of an investment property, an owner has two scenarios for disposition: they can elect to handle the disposition in house, or the owner chooses to hire a third-party investment sales firm, such as the Palomar Group, to handle the disposition process. The largest motivation of an owner electing to handle the disposition of an asset in house is they avoid paying a sales commission. After all, how can this be a bad thing? Let’s take a step back and look at the typical makeup of both owners and Investment Sales Brokers. Each are in similar spaces (i.e. retail, office, multi-family, industrial, etc. ), yet their job descriptions are entirely different. An owner and their employees (for this scenario an Asset Manager) handle a multitude of never ending tasks related to their portfolio. Once an asset is developed or acquired, asset management teams are constantly juggling lease up, re-tenanting, tenant retention, maintenance items, budgets, billing, tenant correspondence, aged delinquencies, value-add opportunity execution, local municipalities, third party vendors, investor reporting, etc. Bottom line: asset management is a full-time job. The benefit of an owner having one person or department solely responsible for asset management is that the value of the asset will be maximized, which is the fiduciary responsibility of owners. Depending on a company’s size and capital, one person may be handling these responsibilities or multiple associates may be responsible for specific responsibilities on multiple assets. An Investment Sales Broker’s sole responsibility is executing on the sell of an owner’s property for the highest attainable value in the market. Let’s look at the tipping point when an owner elects to dispose of an asset. In this disposition scenario we will consider an average size owner with around 25 properties. The norm in the industry is a hold period of 5-7 years. This time frame gives an owner the opportunity to maximize asset value (through leasing, redevelopment, renegotiation of leases, etc ) while taking advantage of depreciation. Firms that own 25 properties acquire somewhere between 1 and 2 properties annually. Let’s assume this same firm is disposing anywhere between 1-2 assets per year. To dispose of an asset on the open market and to maximize value the following will need to be accomplished by the owner. An accurate asset valuation needs to be made based off current market conditions. Marketing material is created for the investment offering, consisting of pictures, aerials, local market research, regional/ national market research, market worthy financial models, tenant information, tenant sales analysis, lease analysis compared to competitive centers, demographics, and an analysis of the demographics. The owner will need to have a digital platform for the property marketing campaign, a database of buyers (developed over years of activity in the market that is always evolving with new buyers coming into the market and previous buyers having filled their buckets for acquisition), a tracking program to monitor the offering process such as Confidentiality Agreements, buyer inquiries, document downloads, how many times information is accessed, emails, and phone calls. The digital tracking program is in place for three main reasons: to make the information easily accessible for a prospect, tracking mechanisms and checkpoints for the owner, and to give the owner the ability to vet the prospects. Once these pieces of the marketing program are in place, implemented and the deal is launched, site visits will need to be organized and scheduled, and offers need to be vetted and countered. Once the program is executed as planned and multiple offers are on the table, the owner determines what deal points are critical to them and what ones they can live without. As soon as those deal points are set by the owner, they hit the poker window of the deal and enter into the thick of it; buyer interviews, multiple rounds of negotiations with Buyer, and the vetting of the Buyers that make it to this phase of the offering all occur in a small window. At the end of the LOI phase, a Buyer is selected. Once a Buyer is selected a Purchase and Sale Agreement (PSA) is negotiated and executed. Once a PSA is executed, the real work begins for the owner and owner’s in-house disposition team. During the due diligence phase, the asset is under extreme scrutiny, leases are being analyzed in great detail, estoppels are being distributed to Tenants, which have to constantly be followed up on with Tenants, survey and title work is being performed, physical inspections are being made by third parties and the buyer’s personnel, meetings are organized with Tenants, the local municipality, and last but most certainly not least, the financials are put through the grinder. Each one of these items requires constant correspondence and dialogue between the two parties, particularly due to the short nature of an investment sales contract. A standard PSA on an investment property has a 30 day due diligence and a 30 day escrow. A lot must be carried out in a small amount of time. Why such a small time frame? Tenant term is always ticking, the more time that passes, the less guaranteed income. Oftentimes, buyers are in the second leg of their 1031 exchange, putting major time constraints on the Buyer having to execute within a set window or pay Uncle Sam. For larger companies that are responsible for paying dividends or preferred returns to investors, the investment capital needs to be in the market, not mothballing in a low interest savings account. A Day’s Work for a Utility Playing Asset Manager? Four Weeks for Pre-Marketing – sales flyer, offering memorandum and setting up the virtual portal with DD material. Five weeks for Marketing – initial marketing flyer distribution to the market, offering memorandum distribution to qualified prospects, and property tours. Two weeks for Bidding – offer deadline, best and final, buyer interviews, and buyer selection. 10 Weeks for Closing – negotiate PSA agreement, buyer due diligence period, and close of escrow. An in-house solution to an asset manager handling this process is that the owner hires more employees to handle the process. The employees in most instances will be on salary, which is more costs for the owner to cary (i.e. social security, insurance, 401k, workers comp, payroll, database subscriptions, marketing platform design, a marketing team for support, underwriter, analyst, association memberships, and travel cost so said employee can get out from behind the keyboard and grow their client pool, in addition to years of building a network with Buyers and Brokers, etc.). The upside is the owner won’t have to pay a commission. Access to a larger pool of buyers as a result of years of being in the marketplace and building a network. Broker bears all cost and time associated with marketing material even if the deal doesn’t sell. In summary, the sales process is long, arduous and detailed. In most instances, the owner has a fiduciary responsibility to their investors to realize the highest and best value of their asset. Any reputable Investment Sales Brokers does not do it part time; it is their full time job, boots on the ground, eating and breathing it every day. Hours, days, months, weeks, years are spent knee-deep in the investment sales market tracking trends and building a database of contacts and resources. 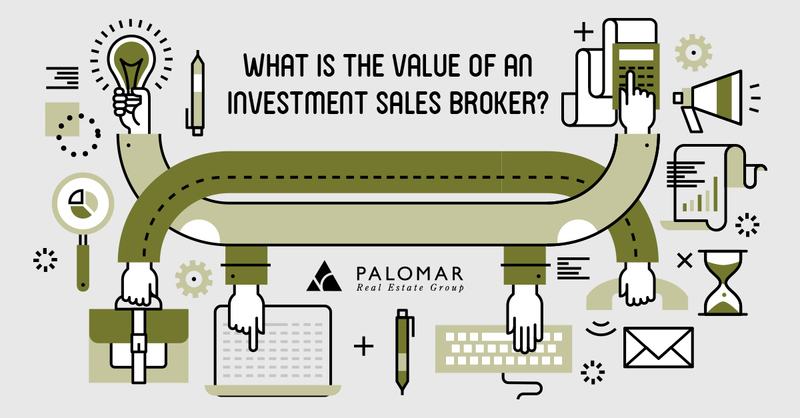 As a result, an Investment Sales Broker is equipped with the tools to secure the highest value for the asset with the most qualified and vetted buyer, that tied with the fact that most owners simply don’t have the time, resources or appetite for handling the disposition in house. The Palomar Group is an investment sales firm that specializes in the sales and acquisition of income properties. For information on the current state of the market or if you have an investment property need on the buying or selling side, contact The Palomar Group here.